How Can I Buy Items I Don't See Listed? How do I use an Online Sports Gift Certificate? How Do I Modify My Personal Information On File With Online Sports? How Are Customers Notified If An Item Is On Backorder Or Out Of Stock? How Can I Stop Receiving The Newsletter That I Signed Up For, Or Stop Receiving Any Marketing Materials? Can We Add Our Products to Online Sports? Returns - Our Guarantee of 100% Satisfaction! Searching - How Do I Find Products? We are also available via online chat during business hours by clicking on the Live Chat link at the top of every page. You can leave messages with us 24 hours a day, 7 days a week on our secure voice-mail system. We hope this helps. If you have any questions about how to use the Online Sports Directory, please send us your comments. We want to make Online Sports a valuable resource you can count on to find exactly what you want, quickly, and conveniently. Online Sports has been created for people with busy lives who love sports - not just watching sports, and reading about others playing sports, but for people who love being an active participant in sports. We love sports, but hate shopping, and chances are you do too. So to help you learn more about products to maximize your pleasure in participating and supporting sports activities, we created Online Sports. Online Sports has been growing steadily since opening in July 1995, and continues to grow daily to be the primary source for information on sports products available online. Online Sports has been structured to be a database of all (or at least most) products being offered for sale online today. Suppliers list their product information, and you can compare price, specifications, and business policies (shipping, warranty, etc.) of the suppliers of the competing products. You won't just find a phone number to call to buy the products off-line, or be told to order a traditional catalog from which you could purchase. When you use Online Sports, you will be able to purchase the products that you want NOW - ONLINE! Get what you want, when you want it, without leaving the comfort of your home or office. Be informed and confident you made the right purchase, conveniently, so you can spend more time participating and less time in parking lots, traffic, and check-out lines. After you select Enter the Online Sports Directory on the front page, you will be linked to the main Directory page. At the Directory, you can choose how you would like to browse. Products are organized by sport, department, item name, team, player and supplier, and you can select the method that makes the most sense to you. Each section has a list of products or a "Table of Contents" with a further breaking out of the items in that section. On the bottom of every page, you will always be able to find help and access other areas of the Online Sports site. Some people like to look at products grouped by sports. If you choose Browse by Sport, all products, books, equipment, apparel, etc. related to that sport will be presented to you in an easy to use hierarchy. You may have a particular manufacturer in mind - perhaps one you have always liked in the past. If so, you can choose to Browse by Brands where you will see the list of suppliers participating in the Online Sports Directory. Learn more about their company, or just go right to their products to find what you are looking for. Products are also grouped into Departments, for people who like to browse through a general category. Each department will be broken out into sections that make sense. You may also choose to browse by Player or Team to find products related to your favorite player or team. And if you know the specific product you have in mind (like baseball bat), choose to Browse by Item where you will be able to search for an item by its name (baseball bat), in the same way you use the index in the back of a book. All of those items, from the various suppliers, will be presented to you to review. When you get to the desired section of the Directory, you will find a list of products, and will be presented with a brief description of the product, the price, and suppliers name. You may select the name of any item on your list, and you will be linked to a page showing more information about the product, including pictures. You can either select the button to start the ordering process for that item, or you can select your "Back" button and return to the previous page. From there you can continue to browse, or check the box next to the product name if you would like to purchase that product later, and then continue to browse. After selecting all the products on the list that you would like to purchase, select the "Start Order" button, and you will be walked through the ordering process. You will be prompted to provide information we need to get the products shipped directly to you. At any time, you may choose to continue with the ordering process, or cancel by linking to any page within the Directory. Name (and item number if known) of each item you would like to purchase. The quantity of each item you would like to purchase. The items you order will be shipped after we receive your credit card information, or after we receive your check. You should receive your order within 1-2 weeks after we receive your order and payment information, or sooner if you specify premium expedited shipping. Your billing address is the exact address on file with your bank or credit card company. It is also the address in which the bank or credit card company mails your monthly statements to. How Can I Buy Items From Online Sports I Do Not See Listed Online? We have tens of thousands of items that are not online yet, and are able to special order many other items. Just send us email at requests with a description of what you are looking for and we will reply by return email (or phone if you provide your phone number) regarding the availability and price of the item. Online Sports welcomes school and government agency Purchase Orders. Please be assured that your PO will be handled promptly and accurately. Other organizations may qualify for PO terms as well, but need to phone or email for prior approval. We must receive the hardcopy of your PO by fax or mail before your order can be processed. To submit your PO via phone, please call 1-800-856-2638. Have the PO number handy and our customer service staff will be happy to assist you in completing the order. You will be issued an order confirmation number and we ask you to make note of that on your PO prior to faxing it or mailing it to Online Sports. You may also place your PO order online using our regular online order process. Please complete all of the required fields and type your PO number in the "Comments" section of the order just before you hit the final SUBMIT button. You will be issued an order confirmation number and we ask you to make note of that on your PO prior to faxing it or mailing it to Online Sports. To submit your PO via our toll-free fax order line, simply send the fax to 1-800-856-2632. Please be sure your name and a complete day-time phone number is noted on the fax as well as an active email address we can use to confirm receipt of your order. If you have any other questions about your PO, please call 1-800-856-2638 or email. If you need to cancel an order you have already placed, please call our customer service line at 800-856-2638. While we will make every effort to cancel your order before it leaves the warehouse, please understand that this is not always possible. 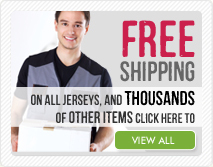 Online Sports strives to ensure your order will ship on or before the expected published lead-time. Freight shipments or custom orders cancelled in excess of 48 hours after placing the order will sustain a re-stock fee and non-refundable shipping charges. For that special hard-to-buy-for person in your life, send them something you'll know they'll love -- a gift certificate from Online Sports. Gift Certificates make terrific gifts for family and friends who may want to make their own selections. These certificates are available in any amount and can be used to order online or by phone. You can purchase Gift Certificates online, or you can call Customer Service and order them thru one of our friendly representatives. If you have any other questions about your Gift Certificate, please call 1-800-856-2638 or email us. If you would like to update any billing or shipping information, please call our customer service department at 800-856-2638 and we will update your information right away. Online Sports does not sell, rent, or give away your personal information to other companies. We do send the Online Sports email newsletters to customers who sign up for it, and we also provide email notifications to existing customers regarding specials available at Online Sports. To unsubscribe to the Online Sports Newsletter, or to stop receiving any information from Online Sports, please send a blank email to: [email protected] and you will be removed from future emails. If the product that you ordered is not able to arrive to you within the leadtime you were told when placing the order, you will be notified by phone or by email of the estimated ship date. You will be able to let us know either to keep your order active or to cancel the backorder. The Online Sports Catalog does not have a hard copy equivalent. With over 70,000 items, and with new additions coming in daily, it is only available online. Since we are working with hundreds of companies that are sending in more product information, please check back with us regularly to see if we have the items you are looking for. *Note: Choosing an expedited shipping method does not allow an item to ship any sooner than the stated time to leave the warehouse; expedited shipping reduces the time an order takes to arrive at the shipping address after the order leaves the warehouse. Please see our Shipping Page for more information on available shipping methods and costs. With Ground delivery in the Continental US, your order will arrive within 1 - 8 business days after it leaves the warehouse. We also have Expedited (Next Day, 2 Day and 3 Day) options available for most items, which means your order will arrive 1, 2 or 3 business days after it leaves the warehouse. Yes, we do ship internationally. Shipping costs vary greatly depending on the size and weight of each order, as well as the location of the country to which it ships. Consequently, please submit your order online and you will be contacted by email if the shipping costs are higher than what is shown online (as shipping cost for the continental U.S.) If you prefer to have the order ship without your approving the exact fee, please include a note in the COMMENT section of the ordering page that you would like to have the order shipped immediately and that you approve shipping fees up to a certain amount. Please note that the shipping charge to your country does not include customs, duties, taxes or broker fees that the carrier or your country may impose once your package reaches your country. Online Sports does not collect international duties and taxes and cannot predict what your particular charges may be. If you do incur these additional charges, they must be rendered in order for your package to clear customs. For more information regarding your country's custom policies, please contact your local customs office. Yes, please use the ADD link in the menu at the bottom of any page within Online Sports and you will see how to go about adding your products. Your satisfaction is most important to us. If for any reason you are not completely satisfied with your purchase from Online Sports, simply return it within 90 days and the product cost will be refunded in full. Please email returns, or call us at 800-856-2638 to request a return authorization number. Please make sure you first obtain a return authorization number before sending an order back for a refund or exchange as we can only accept returned packages that have an RA# written clearly on the outside of the package. Please note that products need to be in their original packaging and can not be in used condition. If a video has not been opened you may return it to Online Sports within 90 days for a full refund. You can either browse through our directory of products or search for products using keywords. If you can't find what you are looking for, please be certain to drop us an email or call us. We have access to many more products than we currently have displayed online, so chances are we have or can special order the items you want. Prices and availability are subject to change without notice. While we strive to make no mistakes, sometimes they do happen. Errors will be corrected where discovered, and Online Sports reserves the right to correct/revoke any stated offer and to correct any errors, inaccuracies or omissions including after an order has been submitted and whether or not the order has been confirmed and your credit card charged. If your credit card has already been charged for the purchase and your order is cancelled, Online Sports will issue a credit to your credit card account in the amount of the charge. Individual bank policies will dictate when this amount is credited to your account.